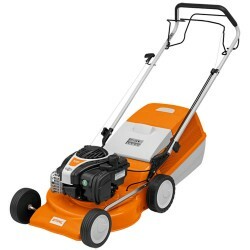 The STIHL RM 4 RT Mulching Lawn Mower is part of STIHLS 7 Series. This makes it ideal for professional users in parks and garden maintenance or for mowing more extensive lawns. It is a self-propelled mulching lawn mower which features optimised design, robustness and high-quality equipment such as QuickFix, quick release handles for compact storage and simple transportation, skirt protectors and a powerful Kohler XT675 Series OHV SC engine. Mulching saves everyone time as the grass clippings do not need to be disposed of, instead, the shredded grass is returned directly to the lawn acting as a natural fertiliser. This helps to provide that luscious green colour we all crave for. Addition features of the RM 4 RT include SmartChoke, which makes the lawn mower easy to start and double ball bearing wheels with excellent grip make the mower comfortable to use even over long periods of time. The front and rear carry handles help with transportation. As well as all of these fantastic features, the RM 4 RT comes with a 5-year domestic warranty which is subject to registration and annual servicing. Easy start engine - Thanks to the SmartChoke technology, the engine starts up reliably and with minimal effort both during cold and warm starting. 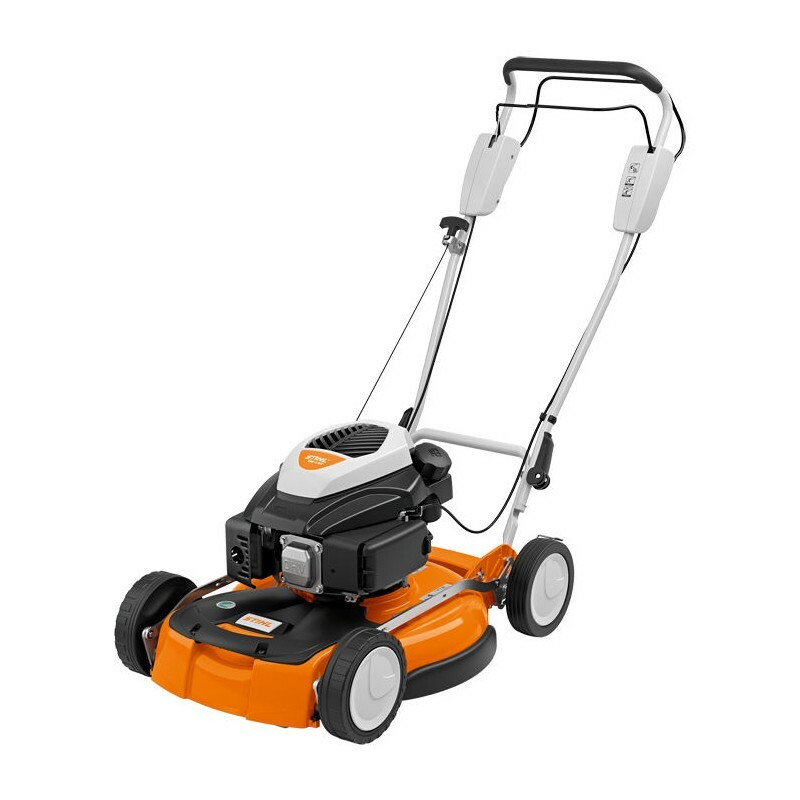 Self-propelled - Self-propelled STIHL lawn mowers take the effort out of lawn mowing. The drive mechanism propels the mower without it physically having to be pushed. This makes working easier, especially on large lawns and inclines. Mulching blade - With the specially shaped mulching blade, the grass is cut in stages and shredded into fine particles in the housing. The fine grass clippings can then fall back onto the turf as a nutritious fertiliser. Mulching function - During mulching, the mulching blade shreds the mown grass before it falls back into the turf as a nutritional fertiliser. And with the appropriate mulching kit available as an optional accessory for this lawnmower, the machine can also be converted into a Multi-mower. 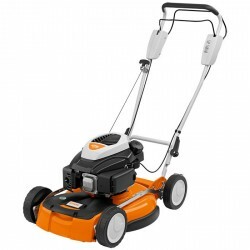 Smooth running wheels - The smooth running wheels of the STIHL lawn mowers are extremely robust and hard-wearing. They have been equipped with a traction pattern and directional stability tread pattern for effortless manoeuvring and to help hold the perfect line during mowing. Super soft grip - The super soft grip is comfortable to hold, especially when used over longer periods. 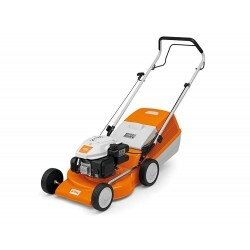 Carrying handles - This STIHL lawn mower is equipped with carrying handles to make transport simple and loading easy. The carrying handles are also suitable as lashing points for securing the lawn mower with a strap during transport. QuickFix quick-clamping devices - The QuickFix clamping devices can be used to effortlessly fasten or release the handlebar of the STIHL lawn mower. This enables the lawn mower to be folded away compactly or made ready for action without using tools. Sheet steel deck - The torsion-resistant sheet steel deck is extremely durable and built to last.